It is important to ensure that you have the right policy in place if a disaster were to strike. Having comprehensive coverage means you can focus on what’s most important: keeping you and your family safe. 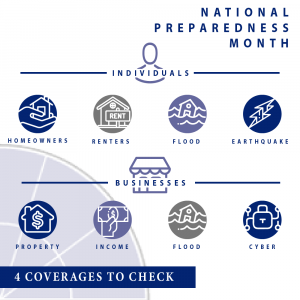 Homeowner: In the event of a disaster, a homeowner’s policy will help you cover damage to your home and other structures, such as fences or garages, personal property, like furniture and appliances, and temporary housing (should you need to relocate because of a disaster). Personal liability for accidents that occur on your property, and medical payments for anyone injured on your property will also be covered by most homeowner’s policies. Renter: If you rent, rather than own your place of dwelling, you’ll have a renter’s insurance policy—makes sense, doesn’t it? A renter’s policy will not cover your dwelling—that’s your landlord’s responsibility—but, like a homeowner’s policy, it will cover personal property, temporary relocation costs, personal liability for accidents that occur on your property, and medical payments for anyone injured on your property. Additionally, a renter’s policy includes coverage for if you accidentally break or damage someone else’s property. Flood Insurance: As we mentioned in our Week One Preparedness Month post, the National Flood Insurance Program (NFIP) estimates that ninety percent of all natural disasters in the United States involve flooding (source) and, because flooding affects every region of the country—even low-risk areas—many people are not prepared. Flood damage is not covered under the standard homeowner’s policy. Instead, a separate policy is purchasable from the NFIP and some private insurers. Under a flood insurance policy, physical damage to your home or personal property directly cause by a flood will be covered. Find out more about what is covered here. Earthquake Insurance: As with floods, damage from earthquakes is not covered under a standard homeowner’s policy and is instead available as a separate policy from most insurers. Earthquakes may not necessarily be a problem in your area, so you may not need earthquake insurance. FEMA has a helpful page to help you to determine your earthquake risk. Disasters can have a huge financial impact on businesses, even if business owners are prepared. Having the right insurance means that your business can get back on its feet as quickly as possible and get back to, well, business as usual. Property Insurance: Property insurance will cover damage to your physical business location, as well as its contents. Business Interruption: In the event that your business needs to close because of a disaster, business interruption or business income insurance will compensate for any revenue you would have earned if your business was operating normally. Additionally, should you need to operate your business out of a temporary location, a business interruption policy will cover rent and utility payments. Flood Insurance: Like with a standard homeowner’s policy, under most property insurance policies, flood damage is not covered and must be purchased separately from the NFIP or a private insurer. Other risks: Unfortunately, today’s world is filled not just with natural risks like floods or fires. Disaster such as cyber- and terrorist attacks are becoming more prevalent and can cause just as much financial or physical damage to your business. And unlike some natural disasters, cyber- and terrorist attacks can happen anytime, anywhere, so it is important to be prepared. Insurance policies are available for both: There are a number of policies that can help protect your business in case of a cyber-attack by providing coverage for data loss or corruption, identity theft, reputation recovery and other costs of a hack. Terrorism insurance will cover damage to buildings, equipment, inventory, and other property in the case of a terrorist attack. Finding the right insurance policies for your home or business can be tricky, but that’s exactly what Georgetown Insurance Service’s experts do. Our goal is simple: Provide the finest quality customized insurance solutions possible and deliver them with exceptional service. Call us today to find the best solution for you! Disclaimer: All data, information, and opinions provided on this article, newsletter, or blog is for informational and educational purposes only. While every caution has been taken to provide readers with the most accurate information and honest analysis, please use individual discretion before making any decisions based on the information in this article, newsletter, or blog. Georgetown Insurance Service, Inc. is not responsible if its readers happen to experience loss, injury, or damage resulting from its display or use. All information is provided on an as-is basis. This article, newsletter, or blog does not represent the thoughts, intentions, plans, or strategies of any specific Insurance Carrier, Georgetown Insurance Service, Inc. partner or affiliate. Have questions? 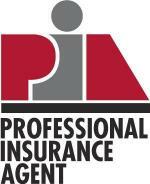 Contact Us to speak with a licensed insurance professional. Georgetown Insurance Service, Inc. is licensed in: AL, AZ, CA, CO, CT, DC, DE, FL, GA, HI, IL, IN, KY, MA, MD, ME, MO, NC, NJ, NV, NY, OH, PA, SC, TN, TX, UT, VA, WA, WI, and WV. Copyright © 2019 Georgetown Insurance Service, Inc.